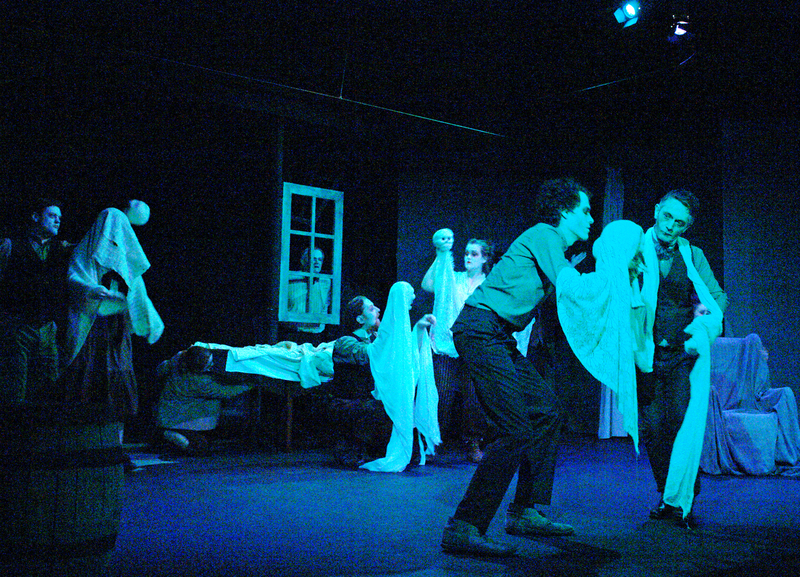 Six sets – ‘The Maids’ / ‘Deathwatch’, ‘Blood Wedding’, ‘Iron’, ‘Speed-the-Plow’, ‘The Servant’, ‘Old Times’, ‘A Christmas Carol’. I’m a great believer in Minimalism – in the sense of ‘Less is More’ as well as ‘doing more with less’. 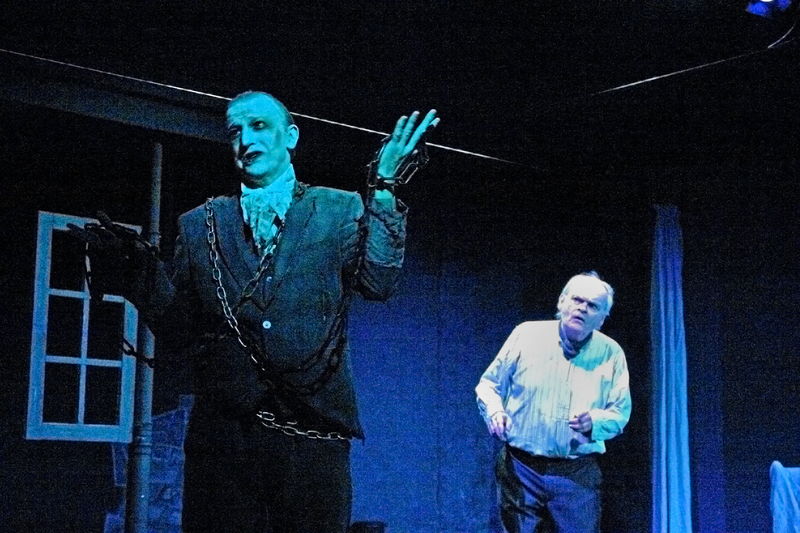 In fringe theatre we simply don’t have the resources – time or money – of mainstream theatre, so we have to work more imaginatively. 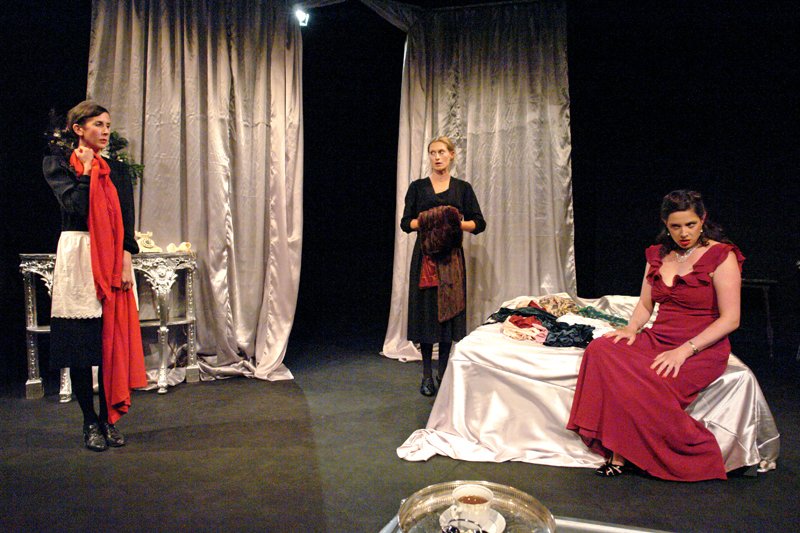 I directed Jean Genet’s ‘The Maids’ and ‘Deathwatch’ as a double-bill on the same evening, with the same set working first for Madame’s elegant Parisian bedroom and later for the prison cell where Green Eyes and his fellow inmates are incarcerated. Two flats, draped in silvery velvet material, gave a sense of luxury, and the gap between them served as the room’s window. Here, by moonlight, the sisters fantasize about being their mistress, for they envy her, and also plot to kill her with a cup of poisoned tea (seen in the foreground ). During the interval, a hinged panel was swung round to fill the gap between the flats. 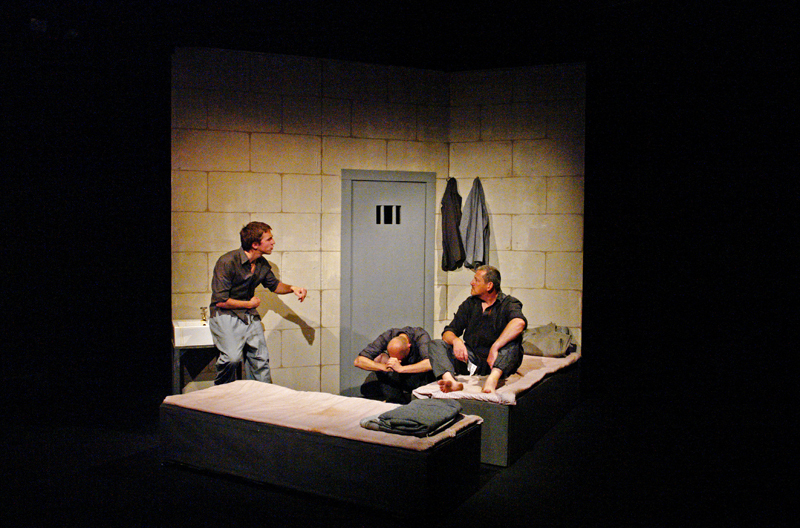 As the second play started the prison Guard pulled down the drapes, revealing the prison walls beneath. The centre panel had become the cell door. He pulled the velvet cover off the huge bed to show the two hard prison beds below. Moved round into an L shape, these became the sides of the cell, and defined the edges of the acting area. Genet’s point, it seems to me, is that the bourgeois Parisian apartment had really been a prison all along! 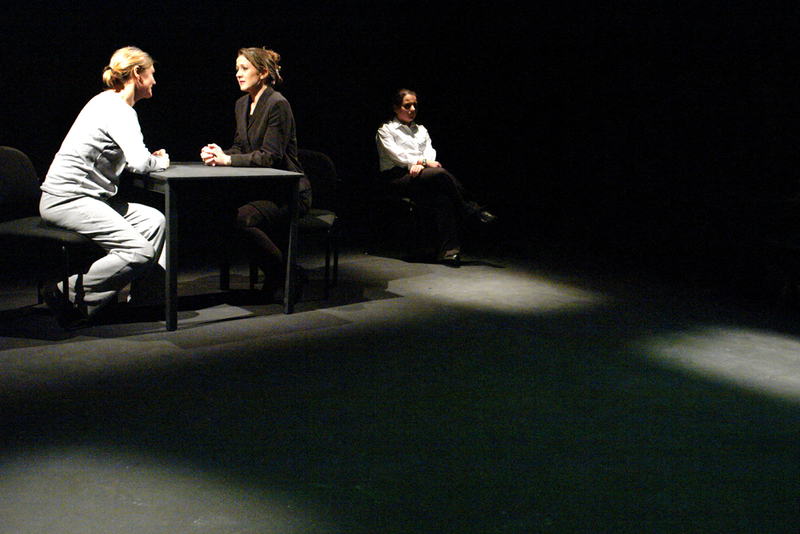 A really claustrophobic space, pooled in light in the middle of the stage, where the three actors moved round each other, jockeying for the position of ‘top dog’, for almost an hour. 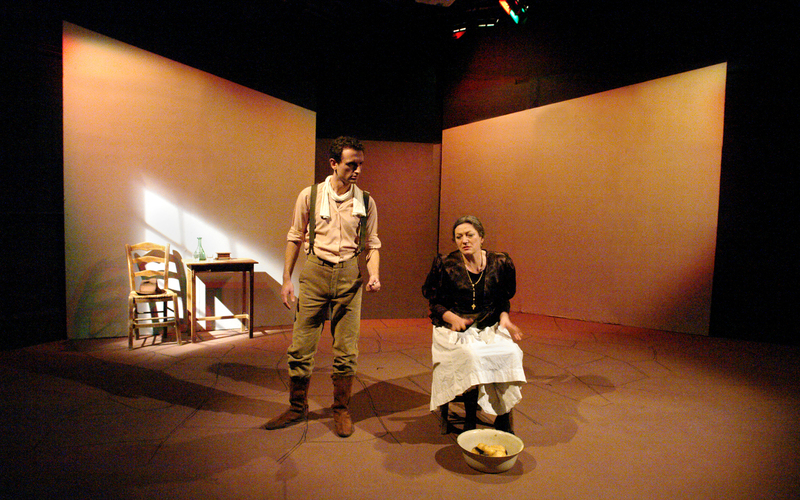 Federico Garcia Lorca’s play is about the drive to acquire and control land in the rural Spain of the 1930’s. A young woman has to marry a landowner’s son she doesn’t really love, to link two families’ estates – but at the wedding she runs off with her former admirer, for whom she feels real passion. 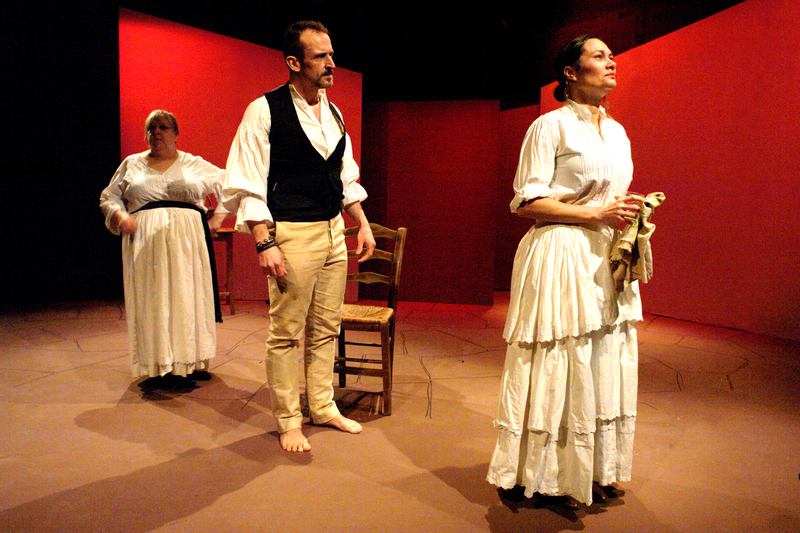 Two families’ honour is outraged, and the couple are pursued into the forest. 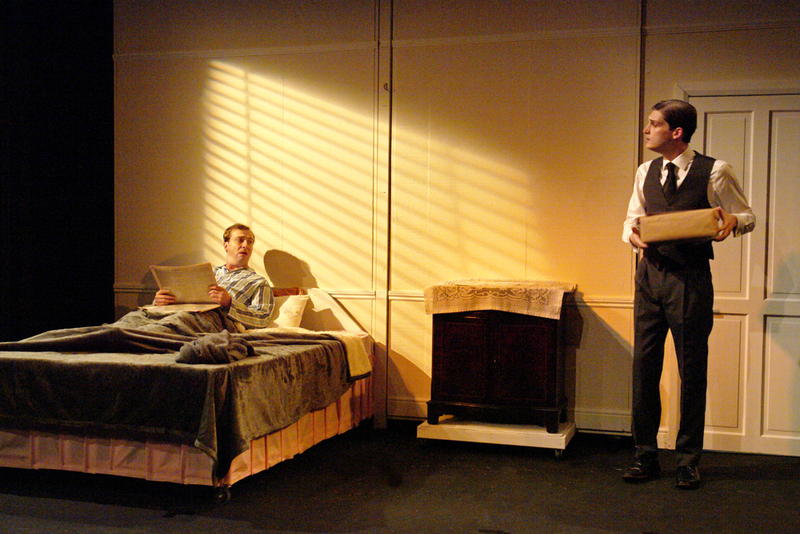 The action takes place in a number of different places, so my concept for the set was to have a very simple and stark arrangement of flats, painted off-white, which could be lit with different colours to suggest different locations. 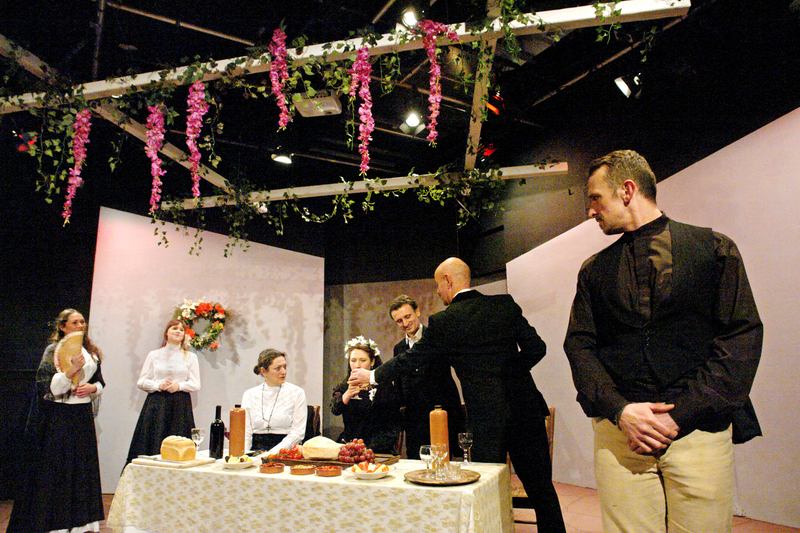 A key scene takes place on the outside terrace of the Bride’s house, and to suggest this location I constructed a canopy, complete with clinging foliage and flowers, which was lowered into position. In the scenes where it wasn’t used, the canopy was pulled out of eye-line back up into the lighting rig. I like to incorporate some moving elements into my set designs where appropriate – it’s another way of getting our limited resources to work harder. 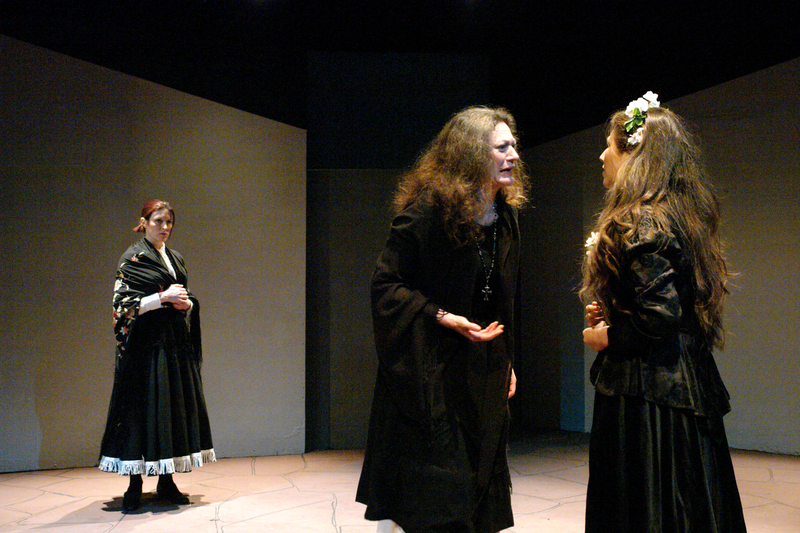 Some sets can be constructed almost solely with light, and Rona Munro’s ‘Iron’ is one of those. It’s set in a women’s prison, and a large part of the action takes place in the visiting room, where there’s a table that Fay sits at with her daughter, constantly under the watchful eyes of the prison guards. I wanted to give a sense of the warders walking backwards and forwards under the harsh prison lights, so I put a series of downlights to define their walkways. As the guards moved, they passed into hard pools of light, then on into darkness. David Mamet’s ‘Speed-the-Plow’ is set in Hollywood, and the action moves between the office of a newly-appointed film producer, and his apartment at home. That transition had to be carried out in front of the audience, so I designed a ‘glass wall’ for the office, that allowed us to see the secretary as she passed behind it. This was hinged so that it could be swung round to become the shelf unit in his apartment. 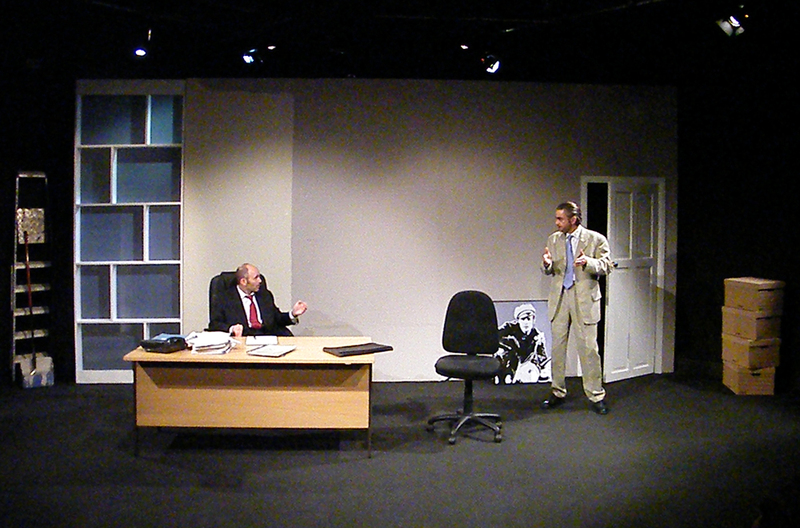 The script tells that his new office is being redecorated, so we put a patch of unfinished paint on the wall, and the stage crew were dressed in painters’ white overalls for the transition. I like to think that we turned a necessary scene change into a piece of theatre in its own right. 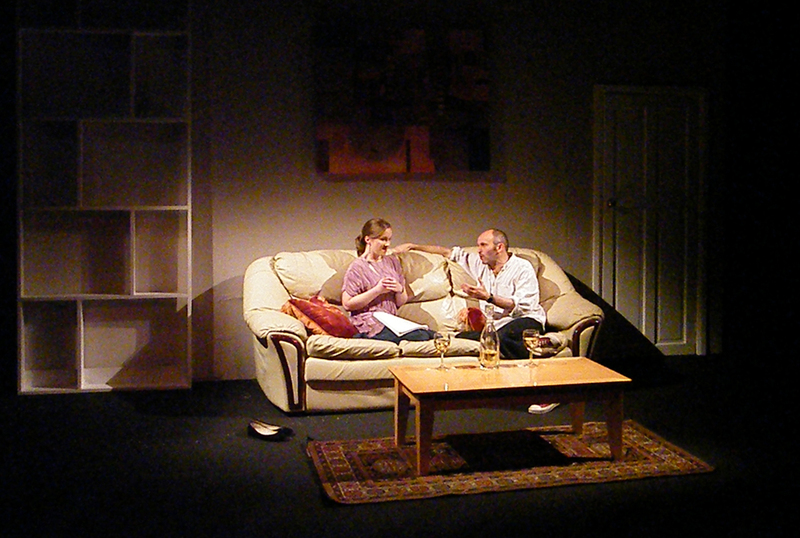 Opening the hinged panel also allowed passage of the desk and the sofa to and from their hiding place behind the set. ‘The Servant’ is a director’s nightmare – or creative opportunity. 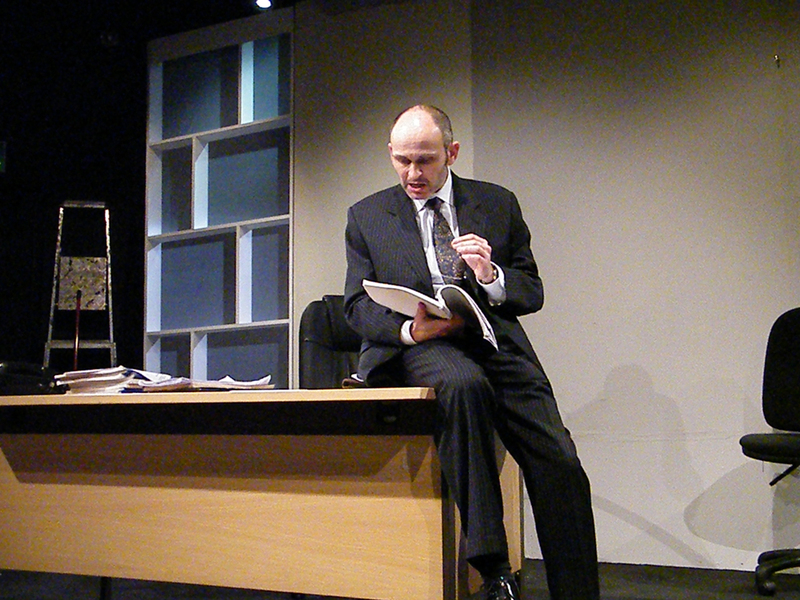 Robin Maugham’s play is about a man who inherits money and returns from Africa to live in London. His friends find him a house to rent, and a manservant to look after him. It’s a psychological piece, where the servant gradually becomes the dominant personality. 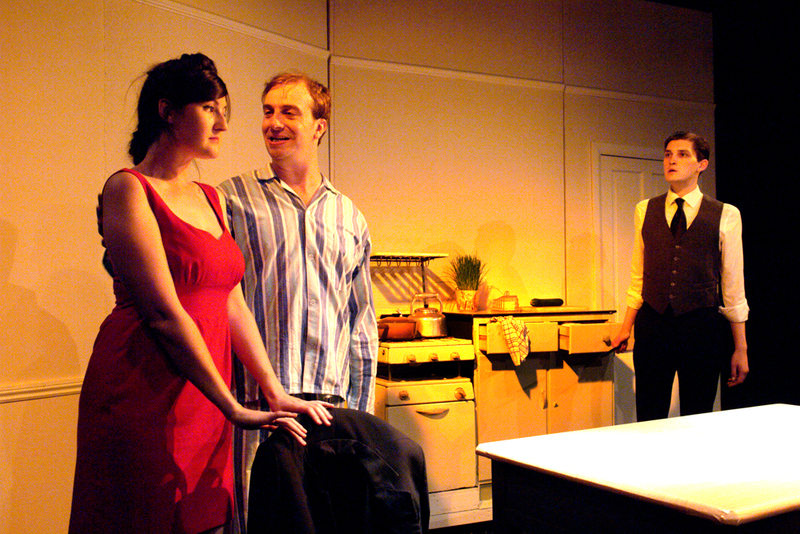 I designed a set consisting of a fixed flat with a door, and two lightweight double-sided flats that could be rotated to present the audience with a variety of combinations – a double bed for the bedroom scenes, for example, or a cooker (and the other flat set at an angle) to give us the kitchen scenes. 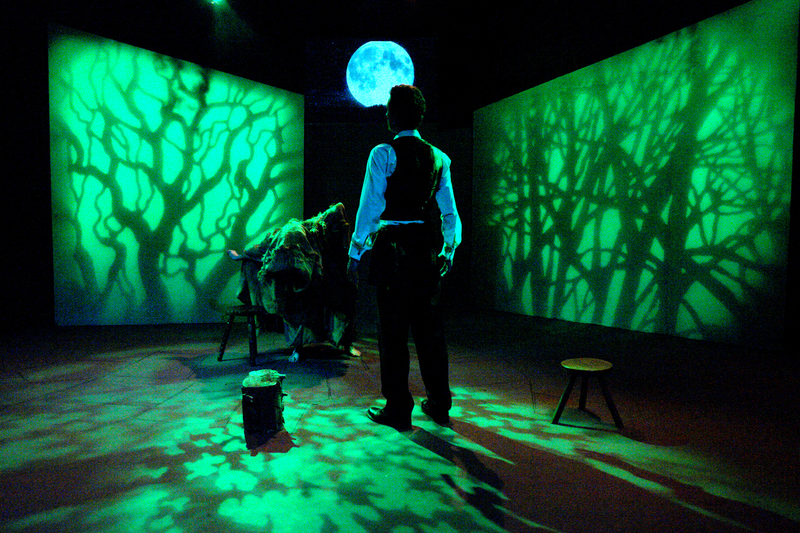 With different set configurations giving three different locations in the house, and lighting to produce a different time of day in each of them, there were many possibilities available to the director. 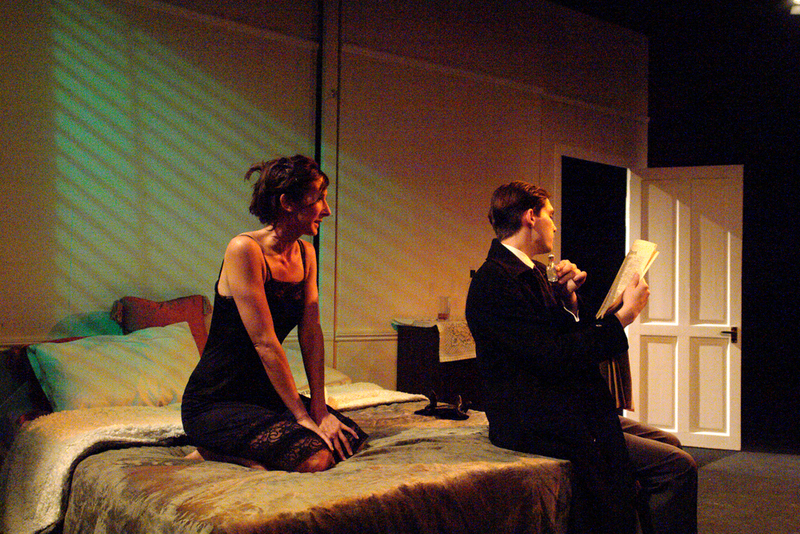 The flats were quickly rotated as required and the action proceeded without delay, without the need to drag on heavy props like the double bed and the cooker. These aren’t my only set designs, of course. 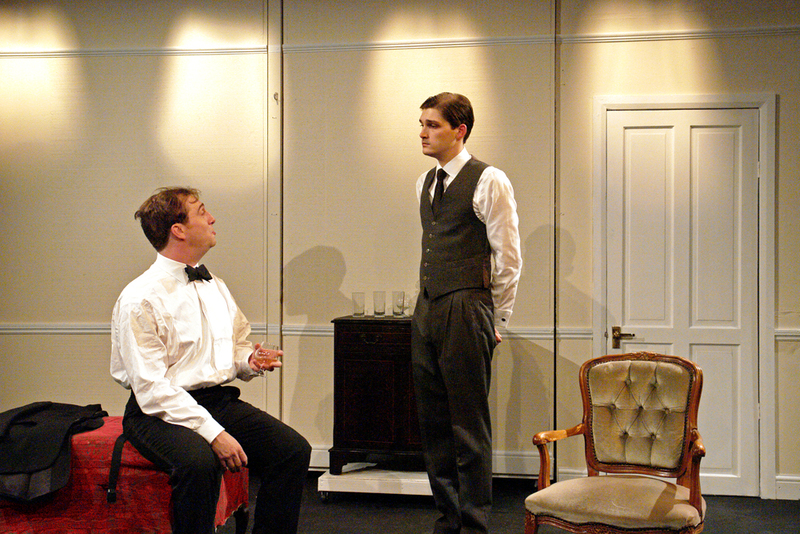 Remember that you can see my rotating set for Pinter’s ‘Old Times’ in the January position on the ‘2014 Projects’ page. 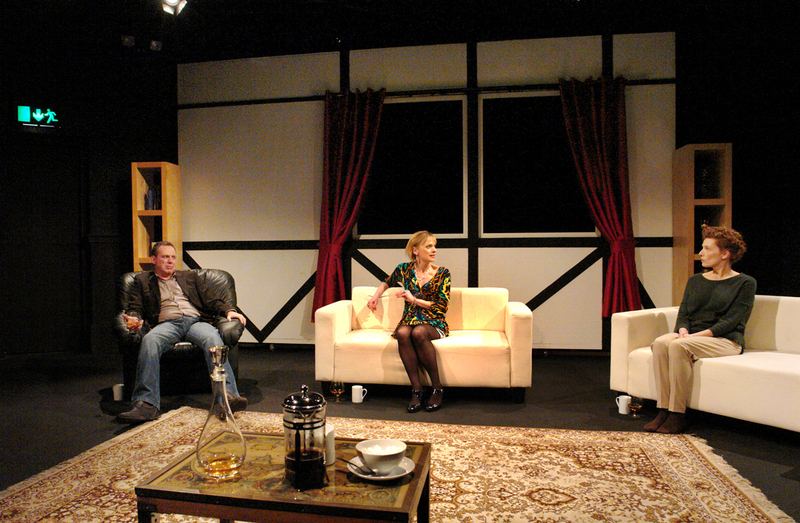 The set panel gave us the living room on one side, with the bedroom on the reverse, and it was turned between Acts, during the interval. 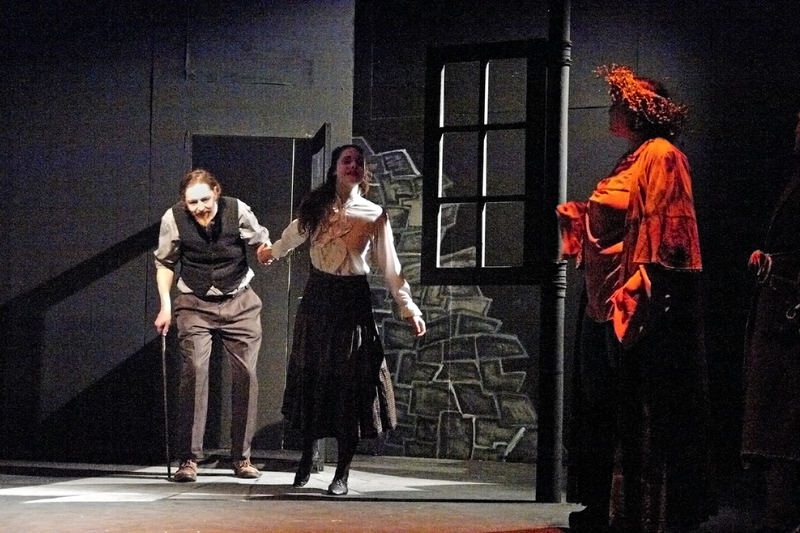 The panel was also pivoted off-centre, so that it hid the bathroom door during Act one, and then revealed it for Act two. As with ‘Speed-the-Plow’, which I mentioned above, the sofas, beds and table were all hidden behind the set during the Act when they were not needed. 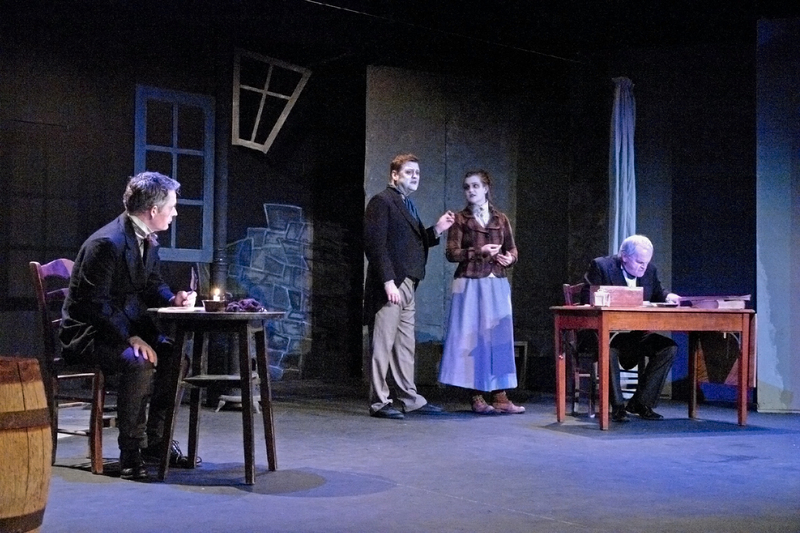 ‘A Christmas Carol’ has events which take place both inside rooms and outside in the street or, as spirits, on the night air. I wanted to allow the action to flow seamlessly between locations, with an actor able to be inside a room looking out of the window, then give the audience a complete reversal of perspective by looking at the window from outside. 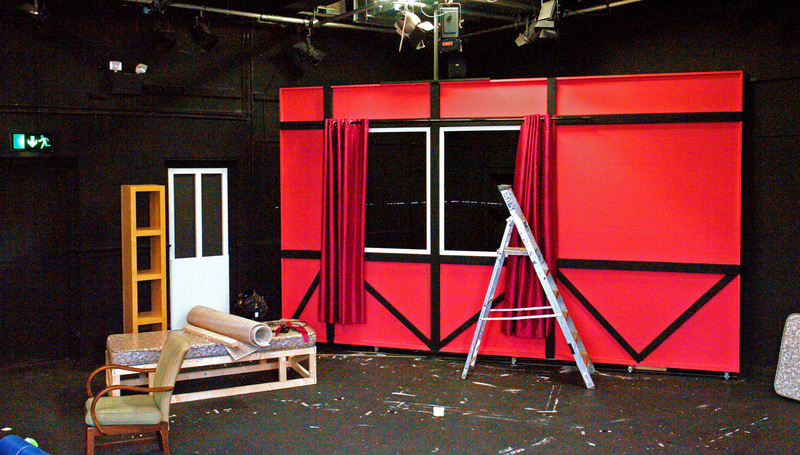 As part of the set, I made use of the column in the centre of the NVT upstairs stage to hang a window, which could be rotated by pushing it round as an actor looked through it. So we saw Scrooge’s back as he peered out through the panes, then as it was turned we saw him from the outside, with the scene he was looking at occupying the downstage area. Left in either position, the window also acted as a basic set element, suggesting a wall and thus defining a room space.